As we head into the Thanksgiving break, we’re thinking of all who have been impacted by the Woolsey and Hill fires. Please be sure to invite your friends and neighbors to our Open House on Sunday, December 2, from 2:00-4:00 pm. This is a great opportunity for families to explore our campus, meet current students and faculty and hear presentations from Peter Bachmann, as well as several faculty, about the courses they teach and life at Flintridge. 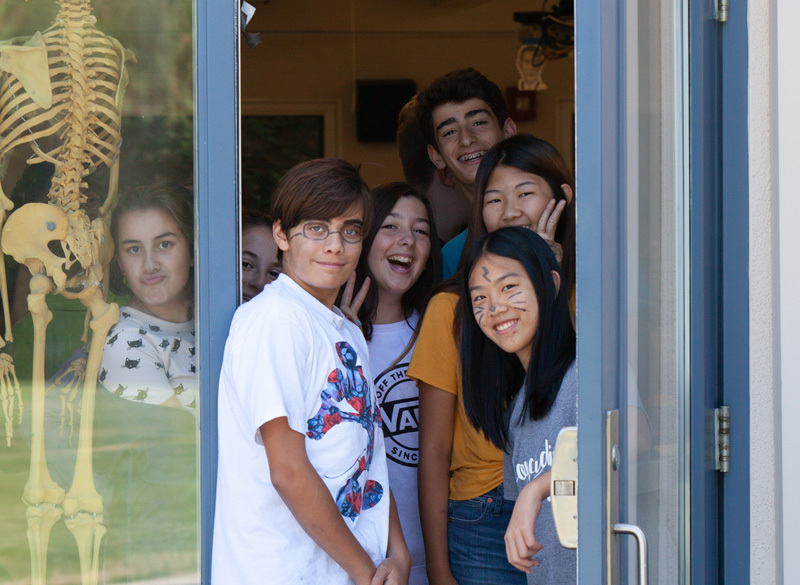 To register for the Open House, visit www.flintridgeprep.org/open-house. To apply for admission online, visit www.flintridgeprep.org/apply. Admissions applications are due January 11. Rebels alumni will gather on December 23 for several on-campus events: Alumni Sports Day, including volleyball, basketball, flag football and water polo; a Graduates of the Last Decade Career Networking Mixer; and Five- and 10-Year Reunions for the Classes of 2008 and 2013. Then, all alumni are invited to the annual Alumni Holiday Party in Old Town Pasadena at Ix Tapa. Note to 7th grade parents: Please do not pick up your 7th grader before 11:00 am, as we keep the students in the gym to reduce distractions for the other students still taking exams. Great news! Construction on the atrium is slated to be completed December 10, barring any delays. Homecoming Celebration Photos Are Up! Click here to take a look at photos from this year’s Homecoming celebration. You can download photos using the password Homecoming18. All photos courtesy of Melissa Kobe. Thank you to everyone who has made a commitment to the Annual Fund this year! We are off to a great start. If you wish to take advantage of the tax calendar, please mail your Annual Fund gift before December 31. Prep's annual STEAM & Service Fair includes science fair projects, robotics club displays, community impact projects and more. The fair is open to 7th-12th graders and will be held January 31 and February 1. It's not too early for students to begin a project. Students who are planning to complete a project that is eligible for the LA County Science and Engineering Fair should contact David Herman as soon as possible. For general information about the fair, contact Nick Ponticello. If you would like to introduce 11th grade students to your fascinating career by having them work with you on May 16, 2019, please contact Colleen Bissner, Co-Director of Alumni Relations at (818) 949-5523. More volunteers are needed, especially writers, engineers, scientists, astronomers, veterinarians and marine biologists. We have a blog! Check your inbox for the next installment of Conversations in Education, coming soon. Most of the fall sports wrapped up their season recently. Both the girls and boys cross country teams are gearing up for CIF finals November 17 and the State meet November 24. Girls cross country won the league title and is ranked 2nd in CIF. They were paced by 2nd place Haley Allen ’19 and 3rd place Sasha Codiga ’19. Boys cross country also won the league title and is ranked 3rd in CIF. Carson Hasbrouck ’19 led the way, winning the individual title. Football ended the season ranked No. 10 and lost in the 1st round of CIF action. Girls volleyball finished 5th in league and narrowly missed advancing to the CIF playoffs. Girls tennis finished 5th in league and will return all its players for next season. Boys water polo finished 3rd in league and lost in the 1st round of CIF. The winter sports teams are preparing for their seasons now, so come out and support the Rebels! The ACL will be continuing with tutoring at the Boys and Girls Club in November, along with starting the Penny Wars fundraiser between the class grades from November 5-16. Proceeds will go to Professional Child Development Associates (PCDA), an organization that helps children with autism and other developmental challenges. Seniors: Congratulations on applying to college by November 1! Over the next few weeks, seniors have several important deadlines. The UC and Cal State applications are due November 30. Remember to make and keep copies of all applications, whether they are mailed or submitted online. Seniors’ final college lists will be mailed home the week of Thanksgiving with counselor comments. Please be sure both parent and student sign and date the list prior to returning to the College Counseling office by Monday, December 3. It’s not too late to order additional graduation announcements and related packages by logging in to www.jostens.com. Please contact Registrar Brenda Diaz if you have any questions about graduation. Juniors: Parents are invited to attend Junior College Night on Thursday, November 29 at 7:00 pm in Norris Auditorium. We will welcome James Nondorf, Vice President for Enrollment and Student Advancement and Dean of College Admissions and Financial Aid from the University of Chicago. This is a parent-only event. College Counseling will officially launch the college process for juniors in January, and college counselor assignments will be posted outside the college counseling office when we return from the holiday break. We encourage students to pursue an academic program next summer in a subject area in which they are most interested. For specific questions regarding searching for academic program options, please contact Gloria Diaz Ventura. When we meet in January, we will outline summer plans for each student. Sophomores & Juniors: An ACT/SAT information session will be held Thursday, December 13 at 7:00 pm in Norris Auditorium. The founder of Compass Education Group, Adam Ingersoll, will walk through the differences between the ACT and SAT exams and highlight a recommended testing plan. Many thanks to all who volunteered for our new event, “Suds, Pies & Prep Ties” last month, especially our parent panel, who shared their personal insights on the Prep experience at each grade level: John Brown ’81, Gene Detchemendy, Ken Kikkawa, Todd Walklett, Geoffrey Arrobio, Andrew Son and Jim Notley ’88. The Fathers Club would like to thank LA Pizzeria Co. and Frogtown Brewery for serving delicious pizza and craft beer for all who attended. Sign up to volunteer for this year’s Graduates of the Last Decade (GOLD) Career Networking Mixer at Prep on Sunday, December 23 from 4:00-6:00 pm. The Fathers Club Internship program fosters a community of lifelong connections and support by providing Flintridge Prep alumni valuable internship opportunities in a variety of professional fields. To sign up to participate, please visit this page. The Parents Association Benefit Committee is hard at work planning a fabulous benefit for the entire Prep community: Flintridge Flashback: A Pretty in Pink Prom. The event will take place on Saturday, March 2, 2019, at Vibiana in DTLA. Proceeds from the event have been earmarked for the new three-story Collaboration Building on the north side of Prep’s campus, which will house three initiatives: STEAM, Global Studies and Leadership. Jeanne and Rob Case, parents of Maddie ’13, Sammy ’15 and Robbie ’19, will be our Flintridge Flashback honorees. Invitations will be mailed in December. We hope to see you on March 2! Thank you to Vanessa Kellam of Health Connected for kicking off our series in September with her informative look at navigating TechSex. We’re looking forward to hosting Headmaster Peter Bachmann for what is sure to be a one-of-a-kind discussion on November 15. Many thanks to our fabulous Speaker Series Co-Chairs Kirsten Harbers and Rob Tolleson for making all this possible! The Music for the World Club (led by Claire Liu ’19 and Max Keane ’19) had a very pleasant afternoon performance on Sunday, October 28 at the Pasadena Ronald McDonald House. The audience greatly appreciated the talents of our students. On Saturday, November 24, Prep student musicians and ensembles will perform at the Flintridge Bookstore & Coffeehouse from 11:00 am to 1:30 pm, in celebration of Small Business Saturday. Our Winter Instrumental Music Concert will take place on December 1 at 7:00 pm in Norris Auditorium. The evening will showcase several Prep ensembles including the Orchestra, Jazz Band and Jazz Rock Ensemble. Prep’s 27th Annual Winter Concert “Holiday Coffee House” will be presented on Saturday, December 15 in the Miller Theater. The hour-long concert features The Flintridge Singers and Vocal Ensemble; The 8th Grade Girls Chorus and Instrumental Ensemble; and Prep’s String Orchestra and Jazz Band. The concert will be presented at 5:00 pm and again at 7:00 pm. Information on how to reserve a seating time will be announced soon. Admission is free. The Dance Department will present its Winter Dance Concert, "In the Moment," on Saturday, December 8 at 7:00 pm. The show will explore the concept of time through the art of dance and feature curricular classes as well as clubs and auditioned choreography. Come out and see how the students have interpreted this abstract theme, with dances about chasing time, jet lag, stopwatches, stars at night and so much more. The concert is one night only, and admission is free. Students are settled in on campus, and Student Senate is fully in the swing of things! In the past few weeks, students have had the opportunity to explore club life through Club Rush and the Community Engagement Fair, embrace their inner Rebel with the advent of Spirit Week and celebrate Halloween by dressing up and participating in a scavenger hunt for candy around campus, all of which wouldn’t be possible without the amazing help of other student organizations such as Club Council, the Student Community Action Council and the Athletic Council on Leadership. In the near future, Student Senate is looking forward to events such as Eight Days of Prepmas and the biennial PrepFest next semester. Please enjoy the upcoming break.